‘Deck Select’ was selected by Michael Yanny from a block of about 300 open-pollinated Aesculus glabra seedlings at Johnson’s Nursery in the early 1990’s. It may a hybrid of Aesculus flava. The tree was first selected for its superior late season foliage qualities compared to others in the crop. Most of ‘Deck Select’s’ siblings lost their foliage late in the growing season due to leaf blotch or leaf scorch. This selection held strong. The tree has exceptionally consistent, long lasting fall color for a buckeye. 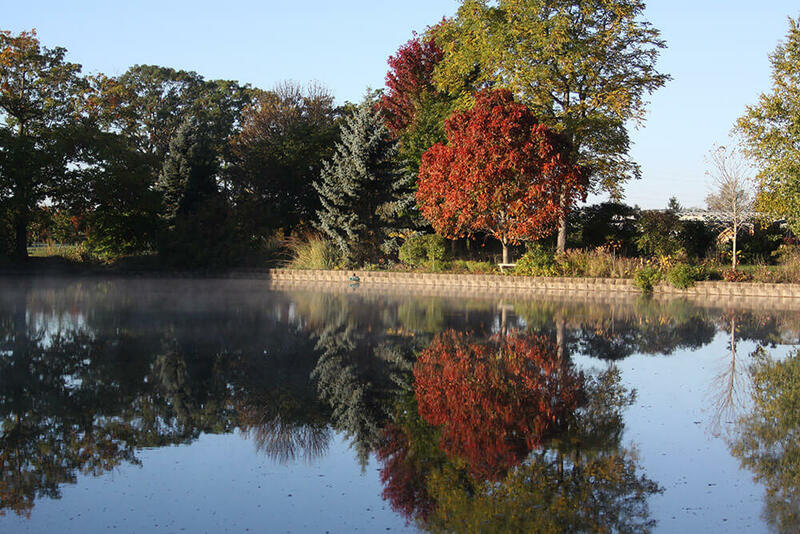 Foliage turns a rich burgundy color and then intensifies to a brighter red over time. The colorful changing process typically takes about 2 weeks which is twice as long as a typical buckeye. Another interesting aspect of the color change is that the individual leaves often have various shades of red, orange and green at the same time. They look almost like a painter’s palette by the way that the colors are laid out. It’s just gorgeous when viewed up close! 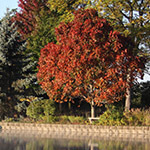 ‘Deck Select’ is a medium sized shade tree with an oval to rounded outline and a dense head. An original plant that has been transplanted twice is about 25 years old, 22’ tall by 18’ wide and has a 10” trunk diameter. The tree has typical yellow buckeye flower panicles and is fertile, producing nuts that are collected by most kids when they encounter them. Though the nuts are inedible for people, they are great squirrel food. The tree is quite tough and durable with the ability to grow in many soil types except those on the droughty side. It should have full sun to truly excel. This is a JN Plant Selections, LLC plant.